haven’t had in a very, very long time. He’s brought a voice to a franchise that has been struggling to find one since they’ve come back into the league in ’99. 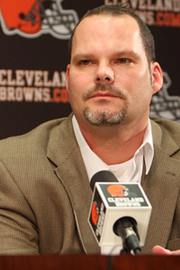 Holmgren has shown confidence in coach Eric Mangini, hired a GM in Tom Heckert and persuaded Bryan Wiedmeier to leave the Dolphins and become executive vice president of business operations. All of this while on the job for less than a week. Browns fans, by nature, are a very cynical bunch. It’s hard not to be when your team has been on the losing end of everything from games played, to the draft, to coaching and GM hires. It’s now become a part of our make-up. It seems as though every time the Browns make a move or draft a player I’m always asking myself, at some level, how long it will take for this guy to fail. 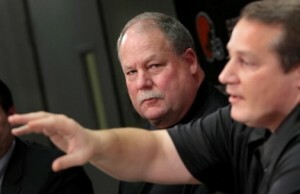 Holmgren seems different. He’s believable. He’s genuine. You trust the guy and want to jump on board and lead the charge.